Readers of this blog might remember that we are fans of second floor laundry whenever possible. It's a high-value improvement we can make in older homes, especially compared to basement laundry machines (next to the box of stuff you didn't sort out since two moves ago, your mother-in-law's upholstered chair, and the mechanicals of the home). If the thought of carrying multiple loads of laundry up several flights of stairs no longer excites you, read on. 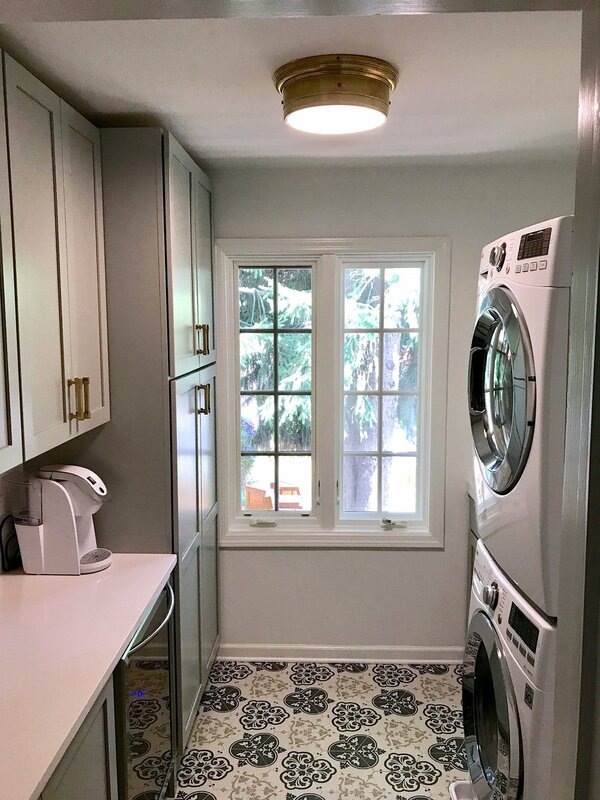 Our client's home had a walk-in storage closet between two bedrooms, perfectly suited for a new laundry room. The basement laundry machines were approaching the end of their lives. Drudgery was winning. Below are pictures of the recently completed 2nd floor laundry. Goodbye to a single-purpose storage room, and hello to a multi-function laundry room. Cabinetry for storage on the left, with stackable full-size laundry machines and sink on the right. I wish we had thought of this, but credit goes to the client for the beverage refrigerator and coffee maker. That is brilliant work in the anti-drudgery department. Eliminating the closet doesn't mean the need for storage disappears. Full extension pull-outs add useful capacity in the tall cabinet. A deep utility sink and drying rack next to the laundry machines. No longer a closed storage room, it was time to reclaim the natural light with a new 10-lite glass door. It's rewarding to convert some routine task into an entirely better experience for a client. Changing the space is one way to upend the ordinary. We're very happy to help this client transform a former closet into one of her favorite rooms. I grew up in a home in which the laundry machines were hidden in the basement. The basement was joyless with bare concrete floors, exposed pipes running here and there, eerie shadows cast by a couple of bare bulbs dangling from the ceiling, and the faint scent of detergent mixed with musty boxes of who-knows-what piled in a corner. Our ping-pong table doubled as a folding table. We carried the laundry up and down two flights of stairs, lots and lots of it, and were reminded that this was "better than working in the salt mines" as if we had luckily dodged the prospect of child labor elsewhere. We've since been convinced of the merits of bedroom-floor laundry with fewer stairs and shorter distances. We recently added second-floor laundry in a whole-home renovation that included tough porcelain floor tile, quartz countertops to withstand most anything, and plenty of storage: sage green cabinets, machines mounted on pedestals that double as drawers, and even space to mount a rod for hanging delicates. Not bad for a room that measures 8' x 6', and all behind a pocket door to preserve square feet. A friend joked "it's like doing laundry in the Hamptons," and we'll take that description over a slightly scary basement any day of the week. It's better in here than in the salt mines. Or my old basement.